High-quality technology blends with a robust, premium Scandinavian design for excellent patient treatment in home and mobile environments. The Vivo 50 is an advanced, reliable and intuitive life-support ventilator. It contains a full range of modes, extensive monitoring solutions, SpO2, CO2, and FiO2, and an easy-to-use menu structure. Treatment can easily be adopted to patients needs by three pre-set profiles and the home-adjust mode. 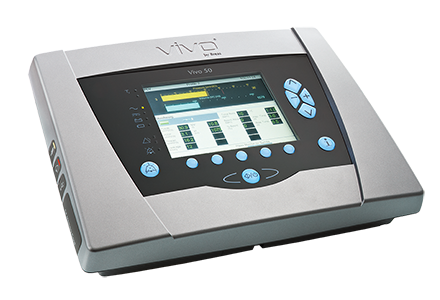 A wide range of accessories make the Vivo 50 highly suitable for use in the hospital, at home and in a mobile environment. Intuitive interface promotes ease of use and training. The Vivo 50 is easy to learn, easy to operate and easy to explain. A full-colour screen and distinct buttons provide easy access to all functions. The menu structure is simple and effective: an i-button explains functions and alarms with a click. Intuitive features help increase patient comfort, save time and reduce the risk for mistakes. Define and control the treatment with extensive monitoring. Vivo 50 is equipped with FiO2, SpO2 and CO2 monitoring solutions, reducing the need for additional devices. The large full colour screen helps physicians easily read the set parameters, waveforms, numerical data and trends. Up to one year of treatment data are stored in a central memory, with the possibility to download data onto a memory card. Advanced PC software enables online monitoring and analysis of treatment data. Enjoy high performance, from hospital to home. In the hospital, high performance is the first priority. The Vivo 50 can be operated in volume- or pressure-controlled modes, with leakage or exhalation valve circuits. Three different profiles optimize the treatment to various needs. Take advantage of multiple alarms or connect a remote alarm and a nurse call function. Mounting bracket and trolley facilitate hospital use. Get a strong feeling of security and acceptance in the home environment. Enjoy high-performance features, premium Scandinavian design and a low noise level. The home-adjust setting increases patient comfort by allowing the patient to adjust specific parameters within limits set by the physician. The ergonomic design makes the device easy to handle. Enjoy the quiet operation of one of the most silent devices on the market. Maintain an active daily life. Vivo 50 offers the autonomy, durability and robustness – plus a full line of accessories – needed for mobile use. The internal battery and click-on battery combination offer 12-hour autonomy. The Hot Swap function allows the click-on battery to be replaced while the device is running. Remote start/stop enables the patient to easily operate the Vivo 50 from the wheelchair. Take comfort in the reliable, robust design. The casing and buttons are highly durable and protective. A special cover protects the Vivo 50 on a wheelchair outside the home. The robust design ensures the device’s long-term durability and cost effectiveness. Find premium technical design on the inside, too. Enjoy the combination of careful design with modern electronic technology. Separate cooling airflow assures optimal temperature control inside the device. Energy management is crucial to controlling the high-performance blower: Energy released from braking the blower is stored and used to accelerate in the next moment. The Vivo 50 fully complies with RoHS requirements for avoiding hazardous materials. Enhance comfort and ease of use with accessories. Accessories enhance ease of use, performance, durability and cost-effective service for both the patient and clinical staff. Vivo 50’s advanced technology has been developed with performance, convenience and market needs in mind. Full monitoring allows view of waveforms, numerical data and trend monitoring. Patient connectivity is enhanced with patient start/stop remote, remote alarm and nurse call system. Get easy direct access to menus on the user-friendly front panel. Freedom of operation is possible thanks to the four-hour internal battery and the option of an additional eight hours from the click-on battery. The FiO2, SpO2 and CO2 sensors give the unit high-end monitoring capabilities with on-screen values and alarms. “Info help” text makes information on alarms, settings and troubleshooting accessible for the user.